117 years after the description of the species Rhinopithecus bieti, by Milne-Edwards, a French scientist, a delegation from the Yunnan University of Finance and Economics (YUFE) took the opportunity of its visit to the University of Franche-Comté and the Chrono-environment lab to examine the 7 holotype specimens of snub-nosed monkey at the Museum of National History, Paris. Then, the delegation has been received by the delegated vice-president of international relations of the University of Franche-Comté, with the aim of promoting friendship and cooperation between the universities and with the Chrono-environment lab. One of the aims of the Natural History Museum of the Citadelle at Besançon being to promote primate conservation, the delegation has been received by Mélanie Berthet, the veterinary in charge of the primate collections. Possible collaboration on the François’ langur, a species declining in its original range of China and Vietnam, and presented at the Citadelle, has been discussed. The YUFE has several conventions with Yunnan natural reserves and field stations, from the Tibetan plateau (Baima Xueshan) to the elephant tropical forest (Xishuangbanna) through altitude dry tropical forest (GaoLiGong Shan). The delegation was interested in better understanding the relationships between researchers and a mountain national park in France. They were driven by Patrick Giraudoux and Manon Jacquot to the Parc National des Ecrins (PNE), where collaborative research is in progress involving the department of Chrono-environment, the PNE and the Hunting Federation of the Doubs and Jura departments. They received a warm welcome from Richard Bonet, head of the scientific department of the PNE and from Eric Vannard, PNE ranger. 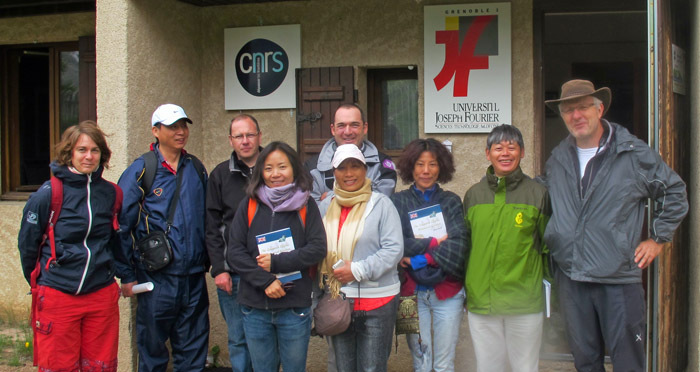 They also visited the Lautaret Botanical Garden, guided by Christophe Perrier, and the Joseph Fourier Alpine research station (read more...). Dr. LI Li, head of the lab "Wildlife management and ecosystem health"
Mme XIANG FEI Dan Zhou, traditional medicine practitioner and manager of the Yunnan Pu’er Danzhou Pharmaceutical Co. Ltd., a phyto-pharmaceutical company. As the result of her award of the French Embassy in Beijing, Dr Li Li stayed at the Chrono-environment lab from June 29 to July 3. The agreement project between the Yunnan University of Finance and Economics and the University of Franche-Comté has been discussed with Anne-Emmanuelle Grossi and Lea Ziri, from the UFC International Affair Bureau, in the presence of Francis Raoul (Chrono-environment) and Patrick Giraudoux (GDRI EHEDE). Research meetings were also hold in the Chrono-environment lab. Dr. Li Li announced that the wild Asian elephant was one of the 5 species (with the Panda, the Tiger, the Snow Leopard and the Asian Crane) whose protection was declared a National Priority within the 13rd Five-Year Plan for the Environmental Health Work of National Environment of the Popular Republic of China. 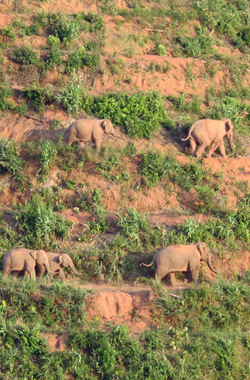 This is good news for the expansion of the preliminary works engaged since 2014 on the elephant – human conflicts with YUFE and the GDRI EHEDE supports. A Chinese multidisciplinary consortium gathering YUFE researchers and other teams interested either in Asian elephant ecology (eg. 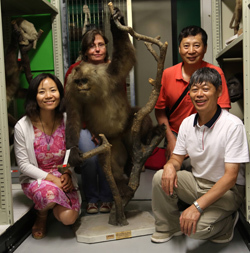 Beijing Normal University) or in Snub-nosed monkey genetics (eg Chinese Academy of Forestry, Beijing) will be created, with the collaboration of other GDRI EHEDE members. Plans have been drawn up on this purpose to organize work for the next months.